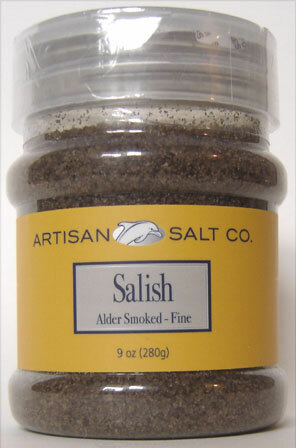 Salish, by Artisan, is orgainic sea salt naturally smoked over Red Alderwood. Its unique smoky flavor is perfect for fish and meats or to be used as a finishing and/or table salt. Salish is the ultimate salt to use on grilled foods. It is especially good on Grilled Salmon. Also adds a unique touch to salads and sandwiches. Comes in a 9oz resealable plastic container with a nice label. Smoked Sea Salts are a wonderful and natural way to add flavor to your recipes. The new breed of smoked sea salts are 100% natural. No liquid smoke, artificial flavors or coloring is added. The salt is slow smoked over real wood giving it a strong, clean flavor without an aftertaste. This is wonderful both on and off the BBQ to add the deep smoke flavor characteristic of the wood used to create each of these salts. They are especially good for cooking fish, chicken, steaks or to top a creamy pasta dish.